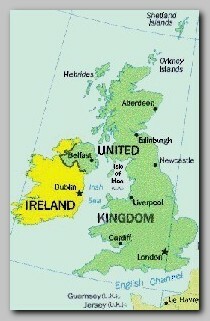 United Kingdom is basically a big island, with some small satellite islands in North West Europe. U.K has a population of about 60 millions people and stretches on 244,000 km. About 2.7% of the general population, 1.65 million people are Muslims. The prominent group of Muslims in U.K is from Pakistani descent. They or they parents got citizenship in U.K mainly through serving in the British Imperial establishment in India and what became on 1947 Pakistan. Most of them have strong ties to their relatives in Pakistan, a strict Muslim religious country. As a former superpower the U.K shaped the border of the Middle East and Pakistan more than the local residents and very often disregarding the local aspirations. It is only natural that the Muslims in those countries blame U.K for much of their problems today. A. The conflicting promises given to the Arabs during World War I.
Hussein-McMahon Correspondence from 1915-16 promising an Arab independent state in the Middle East, on all the land liberated from the Ottoman Turkish empire, due to the support of the Arabs in the war. The Sykes-Picot Agreement with U.K ally, France, from 05/16/1916 to share the Middle East between the two superpowers after the World War I. The Balfour Declaration from 11/02/1917 promising a homeland to the Jews in Palestine. This declaration is considered still today by the Arabs and the Muslims in the world as a British plot to keep their presence in the Middle East and is the original source of destabilization in the region, to their understanding. B. The dividing of Kashmir in 1947 that led to an ongoing conflict with India. Great Britain has also a long history of intervening in the Muslim world, also by military force, and its political and economical development. In the last three decades U.K implemented a very liberal political asylum policy. Among the people who used the opportunity were also some of the most dangerous and provocative Islamic extremists: Abu Qatada, sentenced to death in Jordan and Al Qaeda senior operative in U.K, Abu Hamza al-Masri the Imam of Finsbury Park Mosque in London and wanted in USA and Australia for the murder of 4 Western citizens in Yemen in 1998, Omar Bakri Muhammad, notorious killers from the civil war in Algeria, the leadership of Hamas and many other instigators preached freely their hate, plotted atrocities and called to kill innocent people in other countries. All of that was going on under the protection of British law. British authority claimed that the Islamic fugitives face torture and death sentences in their native countries and therefore can not be extradited back to their homelands. U.K authority never explained why the only alternative was a complete freedom, not only of speech, but also of conducting terror in other places. There was always the alternative to condition the asylum in reasonable lawful conduct. Today (03/2007) British soldiers are fighting with NATO forces in Afghanistan against the Global Jihad and in Iraq against local insurgency. U.K already changed the law and under the 2000 Terror Act limited the civilian legal rights. * The combination of a large Muslim devoted community, years of free incitement for Jihad in U.K by most wanted Islamic activists in other countries, a Colonial and Imperial legacy and a policy of constant interference in the conflicts in the Muslim and Arab world put U.K in a very delicate position in the confrontation with the Global Jihad. U.K is now facing a growing internal trait of Islamic terror from its own local Muslim community. Although U.K managed to foil many of the attacks, Britain suffered the London 7/7 , which caused the death of 52 people and the London 7/21 attack. U.K became one of the main fronts in the conflict with the Global Jihad. * U.K must get ready to the real possibility that after the war in Iraq will be over, or even before, the priority of Islamic militants all over the world will be to take British citizens hostage in order to release the hundreds of Islamic activists that are held in jail in U.K. These activists accused for attempts to carry out terror attacks in U.K are considered by Muslims as idealists who risked there life and freedom for the Islamic insurgency in Iraq. * Tourist resorts, embassies or British journalists all over the world are obvious targets.